This is my first time trying any Volkl tennis string, and I must say that I have been a fool for not looking into to Volkl for strings sooner. 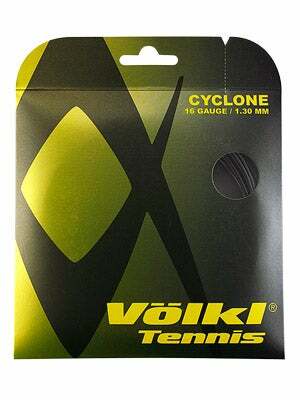 Volkl Cyclone is another one of many tennis string manufacturers who are after the popularity of the RPM Blast from Babolat; the Volkl Cyclone should be consider as an alternative to the RPM strings. The “gear” shaped string, states that it maintains tension and provides plenty of ball pocketing for extra spin. It also offers a softer feeling polyester string, I was skeptical especially with the low price of just under $8.00 – I know right?!? I ordered up a set of Volkl Cyclone and was excited when it was at my doorstep, I immediately cut out whatever was in my racquet and began the stringing process. I strung the Volkl Cyclone at 60lbs, it was a breeze. The string felt more like a 17 gauge. It was very easy to weave the crosses. Knotting off the ends of my string job were simple, because of the softer poly it was simple to loop and tie tightly. Once I began to hit, I was immediately impressed with the ball pocketing and the feel I got from the Volkl Cyclone. It was very comfortable to hit and it never once felt stiff when taking a big swing at the ball. I never felt like I had lost much tension, it maintained very well. I noticed how soft the tennis strings were playing, they felt amazing going through the ball and I was feeling confident that the ball would find it’s place on the court. The only thing I didn’t notice was the little lack of spin, textured tennis strings market themselves as “adding more spin to your shots”. I would have guessed that the Cyclone would be no different. Unfortunately, my hitting partner told me that the balls were coming nicely but did not have any addition kick or spin. I tried hitting the ball with a more western grip, but that didn’t make the ball any better. That’s not to say that the Volkl Cyclone didn’t produce good spin. Overall, the time I spent reviewing the Cyclone was a great experience, probably one of my favorite strings. If I had to chose between RPM or Cyclone, I would 100% go with Cyclone. It’s a great tennis string, it’s soft enough, and firm enough to get great power with great touch and possibly some good spin. The positives of the Volkl Cyclone heavily outweigh the negatives, and at less than $8 a set, you really can’t go wrong.